Enjoy using Grandma's old fashioned shrub recipes. Refreshing vinegar drinks, also known as "shrubs" or "acids," are zesty fruit drinks with vinegar added. That's right, vinegar! The presence of the vinegar added a wee bit of a bite or zest to the non-carbonated soft beverage and helped to prevent it from spoiling in the hot weather. Be sure to taste these amazing thirst quenchers. I can recall enjoying these vinegar beverages as a child in the 1950s. Commercial soft drinks were reserved for special occasions back then, because of their cost, and when you wanted a cooling beverage you made it yourself. The shrub recipes that follow were some of Mom's favorites. Fresh raspberries, 4 quarts; white vinegar, 1 quart; sugar. 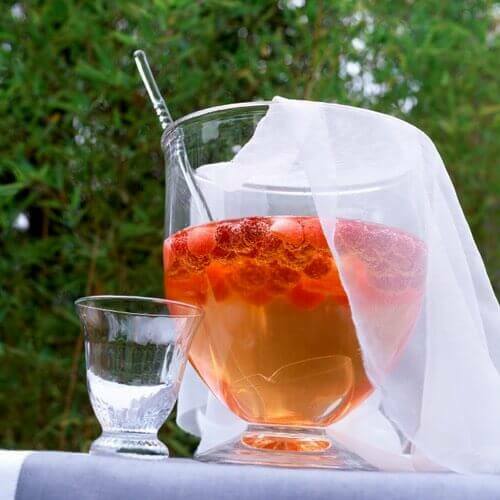 Let vinegar and berries stand for 4 days; strain, and add 1 pint sugar for each pint of juice. Boil and bottle. Keep in a cool place. 3 quarts fresh raspberries, 1 quart vinegar, 2 lb sugar. Pick the raspberries and pour the vinegar over them, stand a week, stirring well each day. Then strain, and boil with the sugar for fifteen to twenty minutes; skim well as it boils. Put into bottles, and cork when cold. This vinegar will keep good a very long time, and it makes an excellent drink for patients suffering with the throat. About 1 dessertspoon is sufficient for 1/2 pint of water. Press ripe red raspberries through a sieve, under which you have placed a fine cloth, so as not to have any seeds in the syrup. Pour the juice in a stone jar and let it sour for four or five days (even six days is not too long), then skim off the white sheet of foam that has risen to the surface and boil the clear juice, allowing a pint of sugar to a scant quart of juice. Boil until it is the consistency of syrup, then bottle it, and when cold cork and seal with sealing wax. This is the finest raspberry vinegar made, rather expensive, but two or three tablespoonfuls are sufficient for a glass of chopped ice and water. To six quarts of red raspberries, allow one scant quart of white wine vinegar. Pour the vinegar over the fruit into a stone jar, cover, and stir the fruit once every day for four or five days in succession, then strain through a jelly bag and boil, allowing a pint of sugar to every pint of juice. Skim off the scum that rises and cook until the consistency of syrup. When cold, bottle, cork, and seal. It is not necessary to buy the choicest raspberries for this purpose. Your grocer, probably, may have a quantity of berries on hand that he cannot dispose of for table use (which are good enough for this purpose), which you may buy at one-fourth the selling price. These refreshing vinegar beverages were once served to summertime guests on the White House lawn. Now you can experience the same taste. Turn over a quart of ripe raspberries, mashed, a quart of good cider vinegar; add one pound of white sugar; mix well, then let stand in the sun (covered) four hours. Strain it, squeeze out the juice and put in a pint of good brandy. Seal it up in bottles, airtight, and lay them on their sides in the cellar; cover them with sawdust. When used, pour two tablespoonfuls to a tumblerful of ice water. Fine taste. Cover sliced pineapples with pure cider vinegar; let them stand three or four days, then mash and strain through a cloth as long as it runs clear; to every three quarts of juice add five pounds of sugar. Boil it altogether about ten minutes, skim carefully until nothing rises to the surface, take from the fire; when cool, bottle it. Blackberries, and raspberries, and, in fact, any kind of highly flavored fruit is fine; a tablespoonful in a glass of ice-cold water, to drink in warm weather. A very nice, cheap vinegar drink which may take the place of lemonade and be found fully as healthful is made with one cupful of pure cider vinegar, half a cupful of good molasses, put into one quart pitcher of ice-water. A tablespoonful of ground ginger added makes a healthful beverage. The raspberry is the most popular flavor ingredient for shrubs, but you can substitute almost any tart or highly flavored fruit to your taste. Also experiment by substituting different types and flavors of vinegar in the old recipes. Shrubs were well known in the eighteenth and early-nineteenth centuries as great summer thirst quenchers, and you'll be both pleased and surprised by their zesty, refreshing taste when served chilled with ice. Drink them anytime.